Alright, one Keeper, two Beaters, three Chasers and... wait, where'd our Seeker go? You've got to be kidding! Five minutes before the match and Potter isn't here yet?! How are we supposed to take on Slytherin house without a Seeker? We'll have to forfeit! We know, we know, last match of the season, we couldn't possibly forfeit. Those Slytherins will be intolerable for the rest of the year if we do. Hey! You! Yes, you! You any good at Seeking? Or do you know someone who is? Yes? Excellent, we might be in luck team! Ok, so you know how it goes right? You can use this broom. We fly out there. We'll take care of the hoops and nonsense and you head for the snitch. You know, the fast little gold thing with wings. Yes, that's your job. Oh, and don't get hit. Their Beaters, they've got a mean streak. Got it? Well since you're filling in for him, here. 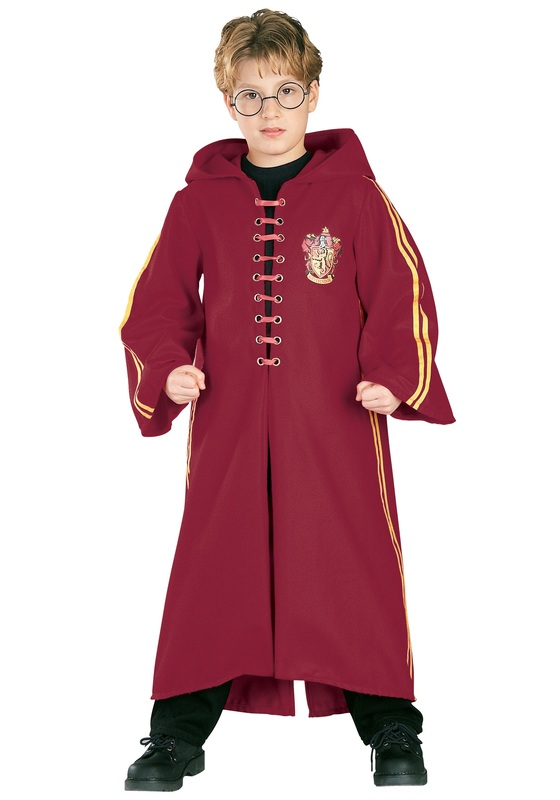 We'll just put you in the Quidditch Harry Potter Deluxe Costume. Yeah, it's got Potter's name and number on the back, but you don't mind, do you? Didn't think so. Classic Gryffindor colors and patch... wait, you are a Gryffindor, aren't you? That's what I thought. Must just be new. No worries mates! Here we go!